While life is busy with a litany of must-dos - work, child-rearing, keeping house, grocery shopping, laundry and on and on - women do not have to push their own needs aside. Yet this is often what happens. There's just no time, right? Wrong. 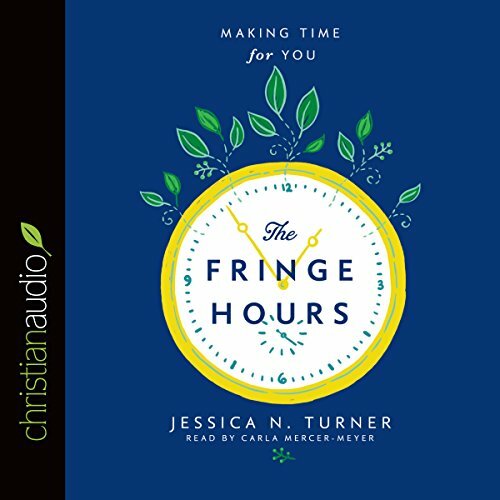 In this practical and liberating audiobook, Jessica Turner empowers women to take back pockets of time they already have in their day in order to practice self-care and do the things they love. Turner uses her own experiences and those of women across the country to teach listeners how to balance their many responsibilities while still taking time to invest in themselves. She also addresses barriers to this lifestyle, such as comparison and guilt, and demonstrates how eliminating these feelings and making changes to one's schedule will make the listener a better wife, mother, and friend. Perfect for any woman who is doing everything for everyone - except herself - The Fringe Hours is ideal for both individuals and small group use. Nope. Too dry and too repetitive. What could Jessica N. Turner have done to make this a more enjoyable book for you? Honestly, I know the author had great intentions with this book, and the message is good. It's just very repetitive and sort of bossy. For instance, I was really put off by the section that explained what I need to do to take good care of myself, such as yearly exams, drinking water, exercising and such. I don't get that from a book called "The Fringe Hours." Did Carla Mercer Meyer do a good job differentiating all the characters? How? Yeah, not much differentiating that needed to be done. Narration was fine. Did The Fringe Hours inspire you to do anything? Maybe. To think about getting up a bit earlier and to delete facebook. That's about it. Book could have been half as long. Love this book so much I need a hard copy now! This book was about so much more than the title eluded to (guilt, comparison, thankfulness, community) and I loved the way the author (Jessica Turner) curated so many quotes, survey responded answers and facts from studies to create this book. I also loved how she gave so many specific examples from her life and lives of many women she knows. It helps me to understand how to apply her insights all the more. I wish every woman in the world would read this book. It's phenomenal! I finally feel like I have the right to take care of myself and not feel guilty. This book was wonderful, even if you already know that you should be taking time for yourself, I know so many moms ( myself included) who don't. There is a huge factor of "mommy guilt" that goes into our choices. I loved all her real, practical, and useable advice about how to fit in more time for yourself. Something's I do, like reading when I'm waiting, but other things I really hadn't thought of. I can't wait to try out some of her ideas so that my friends and I can have more time to pursue our passions and less stress in our lives. Best Christian Self-Help Book I Have Read in a Long Time. Jessica is SO SO SO refreshing. I have listened to several podcast interviews that she did promoting the book, and I was still surprised at how good it is. If you are a woman and you have a schedule, you need to read this book. Every woman should read this book. It is about making time for yourself. about letting you have time for things which you like and want to do. Good book. Read it. What disappointed you about The Fringe Hours? I was hoping to understand techniques to use fringe hours and excel, but most of the book is just inspirational, with no guidance or pointers on actually how to do it. Author does tell about how she goes to gym in lunch hour, sleeps late, wakes up early, but does not explain when does author gets time to have lunch or sleep which is necessary for healthy life. I loved this book for the support and encouragement it provides women that life doesn't need to be perfect. Let go of perfection and embrace functionality and realize that your life must fit you not your: neighbor, friend, sister or mother. Finding time for yourself is not selfish but necessary and can be inspiring to your children and maybe even your friends. It is impossible to fill the buckets of others if your own is depleted. This book was very well written and the narration made it easy to follow along. I highly recommend this book for any woman who struggles with making time for herself. I loved the option of listening to this book while riding in my car to work or while sitting alone during my quiet time. The tips are worth implementing and sharing with my friends. I needed to hear this. I needed to know it is ok to make time for me. Thank you!! The content may seem like common sense, but we can all use the reminder and some helpful tips. If you actually do the little self reflection activities, this book can be a life changer! Thanks for helping me to not only see that I really do have time for things that are important, but for giving tips for using that time effectively! The narrator's voice was calm and seemingly sounded happy, which made for an easy read (listen). What would have made The Fringe Hours better? Less talk about God, it was constant and not what I expect from a self help book. Had to stop listening. What character would you cut from The Fringe Hours?